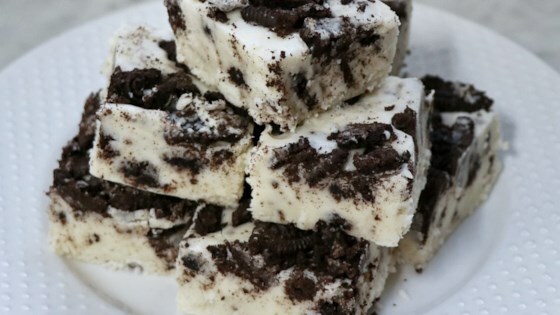 "This Oreo® Fudge is very sweet with loads of cookies. A pretty addition to any holiday dessert platter." Line a 13x9-inch baking pan with parchment paper. Bring sugar, butter, and evaporated milk to a boil in a heavy-bottomed saucepan, stirring constantly; cook and stir at a boil until mixture is smooth, 3 to 5 minutes. Remove saucepan from heat; stir white chocolate chips and marshmallow creme into the sugar mixture until completely melted. Add vanilla extract; stir. Gently fold 1/2 cup crumbled cookies into the white chocolate mixture until just incorporated; spread into the prepared pan. Sprinkle 1 cup crushed cookies evenly over the top. Press cookies lightly into the fudge. Cool at room temperature until set. Cut into small squares to serve. Do not overmix after adding crumbled cookies or fudge will lose its bright white color. Super delicious and tastes just like Cookies 'n' Cream chocolate bars only creamier and with more cookie taste with the hunks of Oreo in there. Mine turned out great with out a thermometer.